Tester 11 results are back and this is an interesting case both in what he feels provokes the symptoms, and also the pattern of the results themselves. 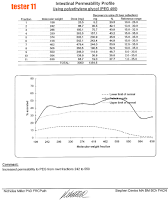 The tester, a male in his early 30's who had had the problem for around 15 years, cannot make a connection between diet and odor occurrences, but makes a certain connection with sexual activity. There are too many speculative reasons why this would be, including possibly something to do with hormones and other chemicals released in the bloodstream. As for the results, the tester was fine for ethanol (implying yeast gut infection) which has been quite a common trend in our study. Instead his gut fermentation test came back as 'probably bacterial dysbiosis'. This seems to be mainly due to the 2,3 butylene glycol result. 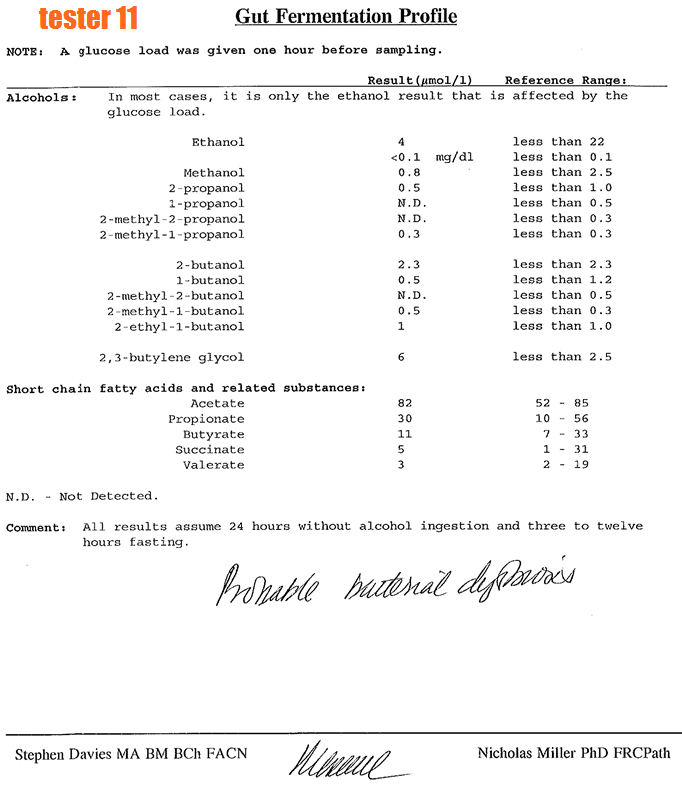 This is the first 'bacterial dysbiosis' gut fermentation result we have had, although others have had alcohols higher than normal but the lab did not seem to think them significant enough. 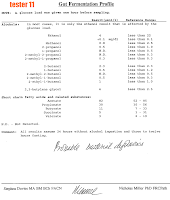 The indicans test is positive, which is generally thought to imply an overgrowth of putrefactive bacteria, and the d-lactate was extremely high. D-lactate is regarded as being produced by lactic-acid producing bacteria from carbohydrate fermentation. 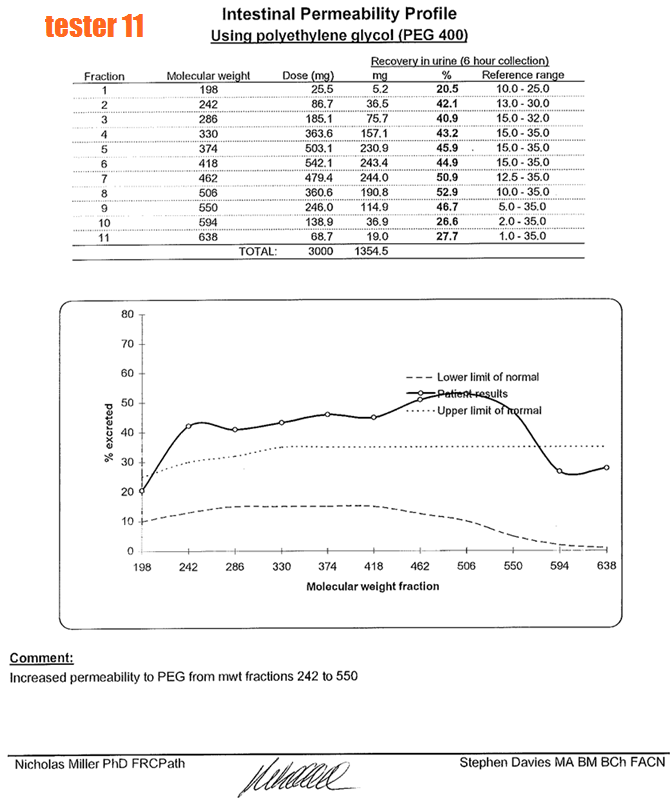 This is only the 2nd person to have a high d-lactate result. We were planning on discontinuing this test, but will keep it as an option now. Gut permeability was also increased (meaning 'leaky gut'); the 7th of our testers that has raised permeability at some stage in the graph. B2 was normal. Only 4 other people have tested for B2, with 3 being deficient. 2 of them also had raised ethanol. Overall, this testers results do seem to indicate a bacteria overgrowth issue in the gut of some kind, but not a yeast issue. 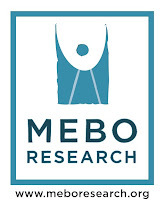 The MeBO-Biolab gut dysbiosis study is a sufferer-led project under the guidance and supervision of Dr. Irene Gabashvili, started by MeBO Research with the help of Biolab Medical Unit in London to use a number of tests from Biolab that specifically test for biomarkers of gut dysbiosis, including yeast overgrowth, certain bacteria overgrowth, and 'leaky gut'. Each volunteer needs to pay for their own tests. The criteria for the tests were total cost, and the tests on offer. Although the study is intended as an example of what health-problem communities could achieve with the internet nowadays; it also hopeful the tests in themselves will be useful, although no direct co-relation can be made with the results and your odor problem. To be included in the study, please fill in the survey and you will be contacted by email.